Gender equality is an integral part of the implementation of the Basel, Rotterdam and Stockholm Conventions, including in the Secretariat’s activities. The project aims to provide a clearer understanding of the impact of hazardous wastes from a gender perspective, and promote gender issues in hazardous chemicals and waste management at the national and regional levels. More specifically, the objectives of the activity are to develop an understanding by the parties and stakeholders on the issue of gender equality, particularly in the context of BRS activities; analyze issues in the scope of the BRS conventions from the gender perspective, including identifying vulnerable groups and different impacts of hazardous chemicals and wastes on men and women, boys and girls; and promote the consideration of gender issues in hazardous chemicals and waste management at the national and regional levels. 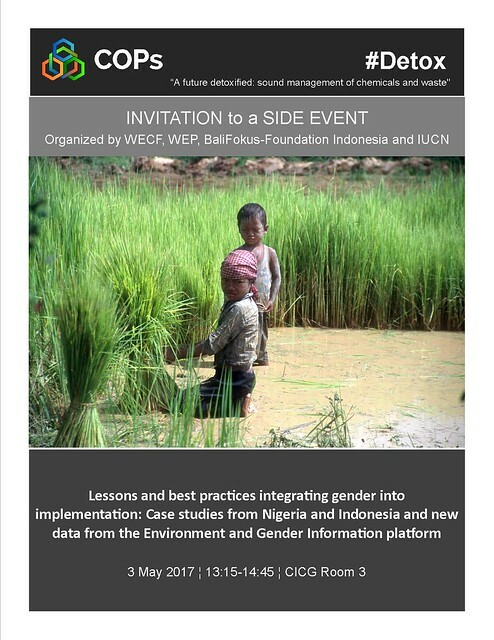 Promote the consideration of gender issues in hazardous chemicals and waste management at the national and regional levels.